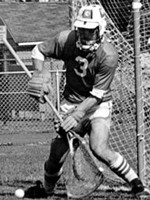 Frederick “Rick” S. Blick was a four-year letterwinner in lacrosse, captain of the 1977 and 1978 teams while at Hobart and William Smith College. Rick was key to their being the NCAA Championship team in 1976 and 1977. His performance won him a spot in Hobart’s College Athletic Hall of Fame. An All-American goalie from 1976-78, he received the C.M. Kelly Jr. Award for the outstanding Division III goalie and the Judge Thomas Kane Memorial Award as Hobart’s Most Valuable Player three consecutive years. Blick played in the North-South All-Star game in 1978. That same year Rick played on the U.S. National Team at the World Championships in Manchester, England. A three-year starter for the Statesmen, Blick compiled an impressive 41-5 record and was a member of the 1976 and undefeated 1977 National Championship teams. He was an assistant lacrosse coach at Boston College in 1979. Rick played post-collegiate club lacrosse for 12 years with the San Francisco Lacrosse Club which won three state championships during that time. Rick’s coaching career began with three years as head coach at Boston College. He has continued to be a fixture in the Northern California lacrosse scene coaching several teams at the high school level and teaching youth players the position of goalie. Rick was the past head coach at Branson High School in Ross, CA and current head coach at Santa Clara University when he suddently passed away on June 2, 2014. Stockton Buck grew up in a lacrosse family in Baltimore. He started by playing on the Mt. Washington ‘Midgets’ team in the fourth grade and went on to co-captain the Baltimore Friends School Varsity Team. He played collegiately at Hobart and William Smith College and says he’s one of the few who can boast that he never lost to Syracuse. In his senior year he was Captain and an Honorable Mention All-American. He was selected to play in the collegiate Annual North/South Game then held at Hopkins, after which he joined the Army and was assigned to the USMA at West Point as an Assistant Coach under Jim ‘Ace’ Adams. In addition to coaching, recruiting and scouting, he played for the Long Island Athletic Club (with some of his Syracuse ‘buddies’) coached by Ritchie Moran. After the Army, he started and coached a boy’s lacrosse team at Sanford Prep in Hockessin, Delaware, and played for the Mt. Washington Lacrosse Club in Baltimore. Upon moving to San Francisco with the FBI, he joined and then captained the then successful San Francisco Lacrosse Club, 1972-75. In 1985 he volunteered to coach at Saint Ignatius Prep in San Francisco and continued to do so thru the 1994 season where he felt extremely fortunate to be able to coach, not only many great young men, but also his two sons, Trevor and Darren. During his ten years at Saint Ignatius he strove to make lacrosse there a premiere program; one of which the players could be proud. He also worked to establish the annual Golden Gate Tournament, was selected as ‘Coach of the Year’ three times and took his teams to the State finals three times. He took five teams to MD and VA where Saint Ignatius surprised a number of east coast teams with the last trip finding Saint Ignatius winning every game including the North County Tournament in Baltimore. Also during his ten years at Saint Ignatius he had five players represent the Northern California Junior Lacrosse Association (NCJLA) at the 1993 High School North/South Games at Hopkins University. He received an additional reward as his son, Trevor, received the MVP award at the event. Stockton coached the Saint Ignatius Alumni Team for a few years at the Lake Tahoe Tournament, coached the Southern Marin Varsity Lacrosse Team (1995) and in 2008 assisted with the Southern Marin 7th & 8th Grade Select Team. In 2009, he was an Assistant Coach for the Redwood H.S. Lacrosse Team, which won the MCALS. Presently, Stockton is adjusting to his new role as grandfather, and enjoying retirement and ‘ranching’ life in West Marin. Mike Gottleib grew up in Baltimore County, Maryland and was a guiding force in introducing lacrosse to his high school (Lansdowne), and co-captained its first j.v. and varsity teams. He was recruited by the Naval Academy for lacrosse and played varsity lacrosse and soccer, graduating in 1970. After graduation from the Naval Academy, with a commission in the US Marine Corps, Mike was stationed in San Diego, CA. Subsequently, Mike assisted with the early growth of lacrosse in both southern and northern California as player, coach, referee, and founder of teams. Although teams had been organized in the Los Angeles area for several years, lacrosse was non-existent in San Diego in the early 70s. He played with the Orange County LC in 1973, was a member of the first San Diego LC in 1974, and then founded the Old Mission Beach Lacrosse Club (OMBAC) in San Diego for the 1975 season. He also founded Team Dole, California’s early contingent competing in the Vail Shootout (1977-1983, and three time champion). After moving to the San Francisco Bay Area in 1975, he joined the Golden Gate LC. A knee injury led to an early retirement as a player, although he later played goalie for the Monterey LC. He continued service as a referee, coach and also as president of the Northern California Lacrosse Association. 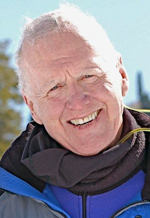 Mike’s coaching career included Golden Gate LC (1978); San Francisco University High School (1979-1980); University of California, Berkeley (1980); Northern California All-Stars (annual North-South competition, and Vail Shootout 1986); US Grandmasters Eagles (1998); and Navy Old Goats (1991-2000, three time Vail champions). 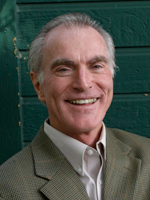 Dr. Gottleib currently lives in Montana with his wife Janet where he is a business consultant for G3 Envision, which specializes in organizational development and marketing communication. Neil Henderson began his lacrosse career at the U.S. Naval Academy in Annapolis after graduating from Fremont High School in Sunnyvale, CA where he was student body president and a first team all-conference football player in 1961. 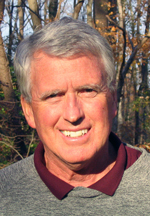 He played football and lacrosse at Annapolis where he was face-off specialist for Navy’s National Lacrosse Championship team from 1963 to 1965. In 1965, he was selected a first team all-American and credited with being the first named for exceptional midfield defense and dominating face-offs during two undefeated national championships. Upon completion of his military obligation Neil became assistant varsity lacrosse at Dartmouth College. He returned to the playing field in 2000 for the Vail Shootout Navy Old Goats Senior Masters Champions. Neil has been inducted into the U.S. Naval Academy Athletic Hall of Fame and the Bilderback-Moore Navy Lacrosse Hall of Fame. After high school lacrosse in Ann Arbor, Michigan, Johanna Thomashefski co-founded Michigan State University Women’s Lacrosse Club in 1991, playing and coaching until she graduated in 1995. In 2001, while pursuing her master’s degree in sport management at the University of San Francisco, she was assistant varsity women’s coach at St. Ignatius College Preparatory Academy, received her officiating rating and played in the Northern California Women’s Lacrosse Association. 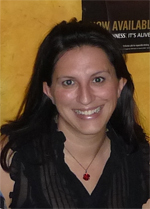 In 2006, Johanna became executive director of Lacrosse for LIFE (Leadership, Integrity, Friendship and Education), a program she co-founded that in addition to various lacrosse activities, provides year-round mentoring and tutoring services to over 300 inner-city youth in San Francisco. She has continued to be active at the national level of US Lacrosse serving on the Youth Council Board (2005-2009), chairing the national BRIDGE (Building Relationships to Increase Diversity, Growth and Enrichment) Committee and helping to develop the EmerginG GroupS (EGGS) program. She currently serves on the Diversity Committee.